Corning has announced its latest Gorilla Glass 6 almost after two years of introducing the Gorilla Glass 5. The Gorilla Glass has become an integral part of the modern day phone screens and is one of the reasons that phone owners can save up on a lot of screen replacements. The Gorilla Glass 6 comes with apparent improvements and like one would expect it’s the most durable glass by Corning till date. The primary focus this time has been on the drop and impact resistance, instead of scratch resistance of the glass. “As consumers become more dependent on their smartphones, the opportunity for potentially damaging drops is also on the rise. Now more than ever, it’s critical that the cover glass provides outstanding protection. 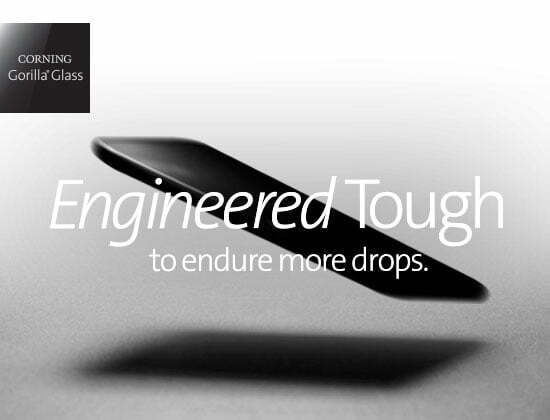 Corning Gorilla Glass 6 improves upon Gorilla Glass 5 by surviving drops from higher heights, but, more importantly, has been engineered to survive multiple drops,” said John Bayne, vice president and general manager at Corning, said about the latest Gorilla Glass 6. Like we mentioned above, the primary focus of Corning this time has been on the drop and impact resistance of the glass. As such, Corning has revealed that according to a Toluna study, on an average people drop their phone seven times a year with most of the drops happening below the level of 1m. In their latest product, the scientists have chemically strengthened the glass to allow for more compression to tackle this problem of multiple drops. The company revealed that in the tests, the Gorilla Glass 6 was able to survive 15 drops from 1m onto rough surfaces, thus proving to be twice as better as the Gorilla Glass 5. The debut of the new Gorilla Glass means that smartphone manufacturers will have a new glass to rely on since a lot of phones these days come with glass back, to support wireless charging. An increase in this phenomenon would eventually lead to a faster and more robust adoption of Gorilla Glass which is already present in 6 billion devices. At the launch event by Corning, the company also unveiled a new range of glass for wearables. This wearable glass range included the Gorilla Glass DX and DX+ which combines the Gorilla Glass and Sapphire glass to feature the best quality. The DX and DX+ take the display readability up a notch by improving the front surface reflection by 75% versus standard glass. The display contrast ratio also goes up by 50% on the same brightness level on the DX and the DX+. The first phone with Gorilla Glass 6 is expected to debut sometime later this year. Notably, over 45 renowned smartphone brands all over the globe use the Corning Gorilla Glass. @d5aqoep Can you cite a source for apple using this emerald glass? It is Apple during Steve Jobs era around 2007, which brought Corning Gorilla Glass to commercial use and Apple has been using it on every device ever since. I can’t comment on the strength of different versions of the glass though. Never had a screen break on me (touch wood!) but then I use a case on every device, dropped a few times and used quite a few product versions. But I can understand that others experiences could be different. @d5aqoep Are you referring to Sapphire glass by GT Advanced? The yields of sapphire glass were never good enough on a large device such as an iPhone etc. They were able to produce much smaller screens. The company ultimately went bankrupt as they were unable to improve their yields. Glass is a Glass……it will break.